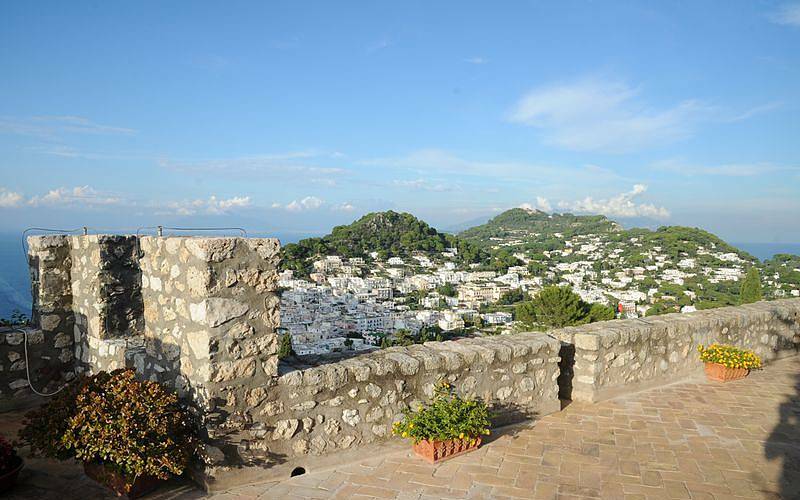 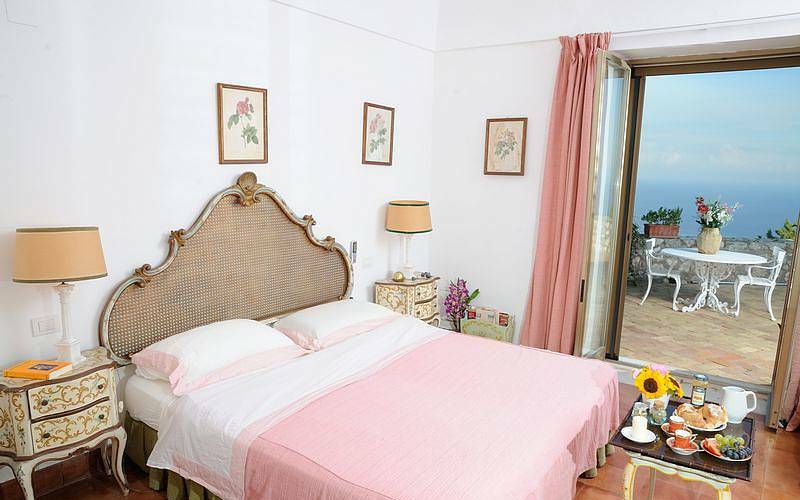 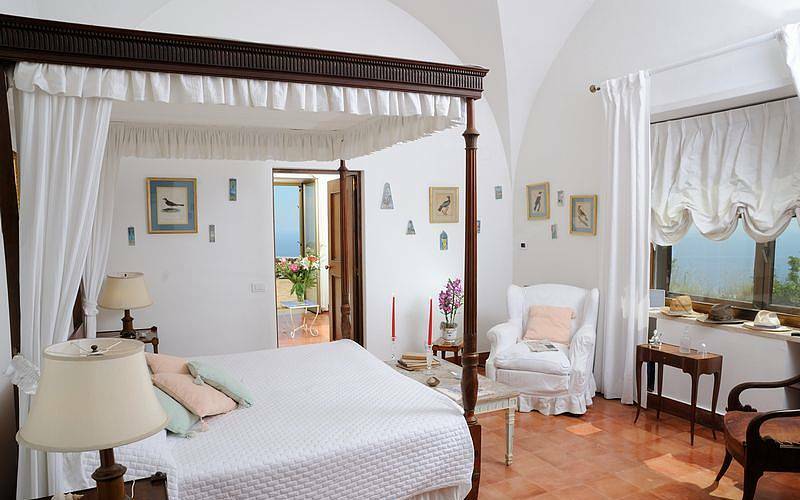 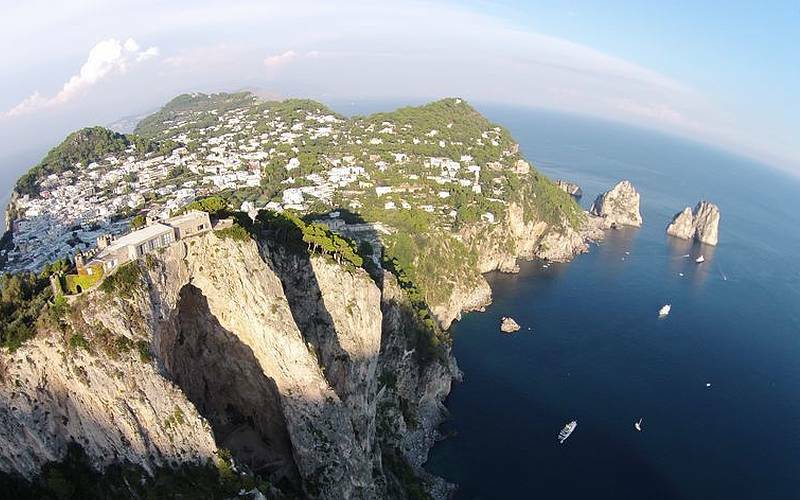 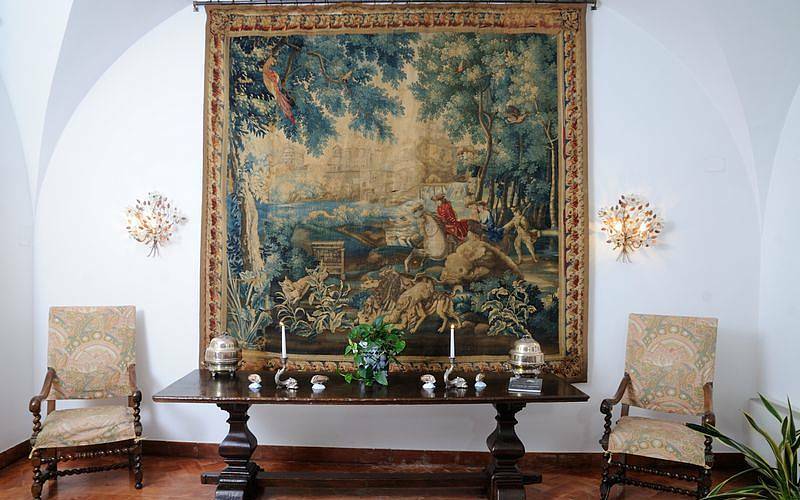 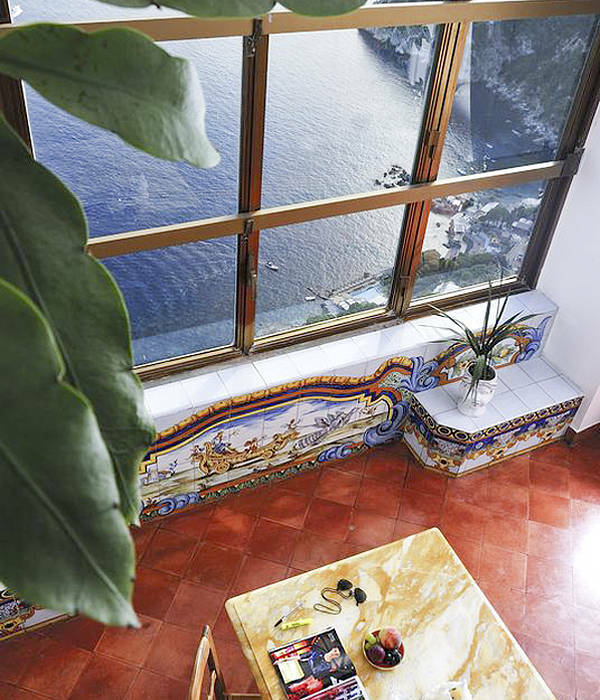 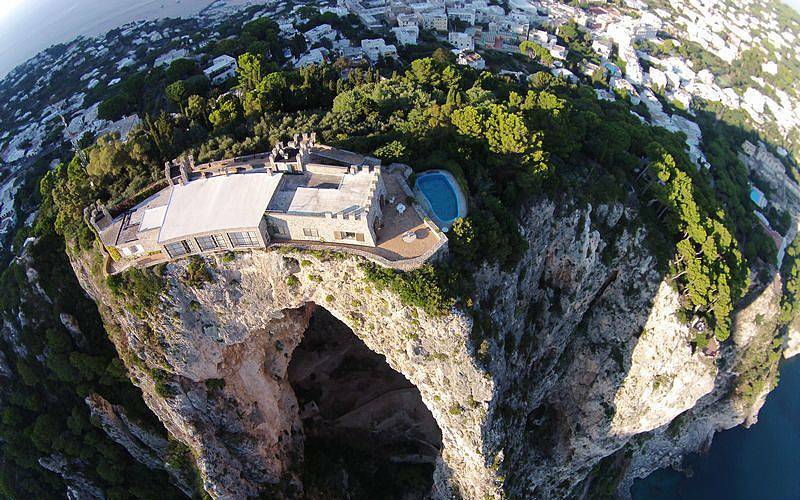 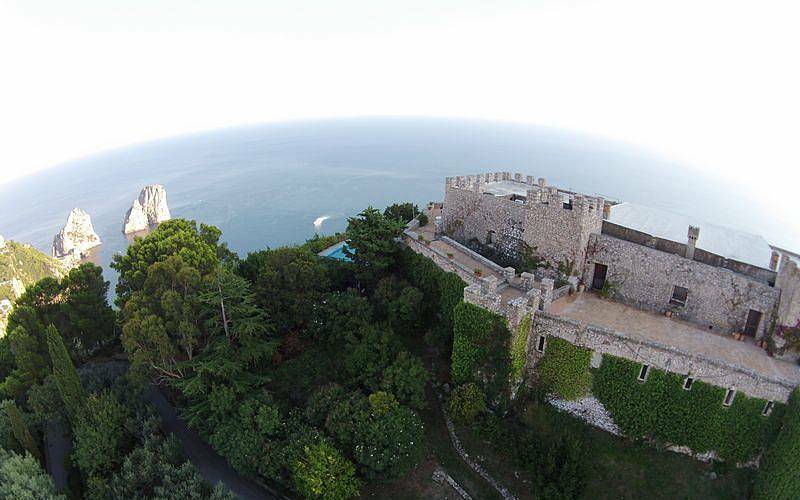 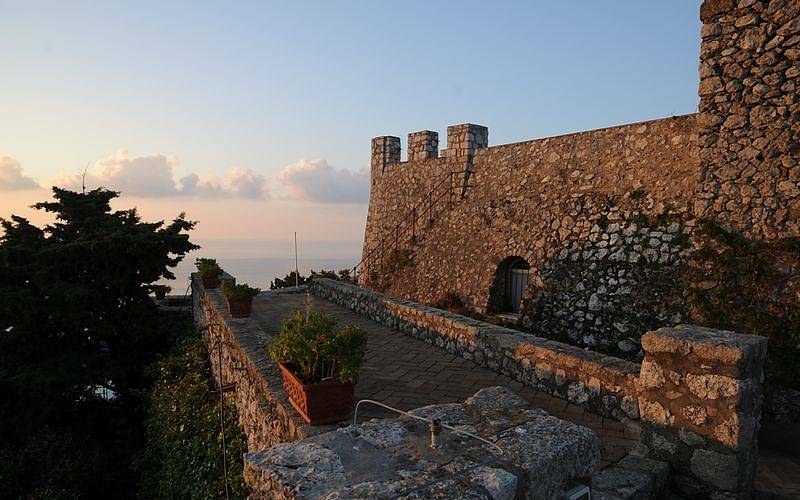 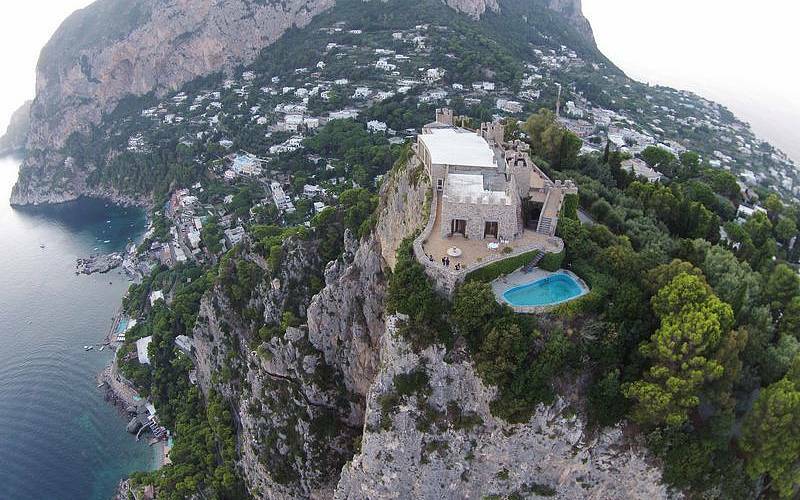 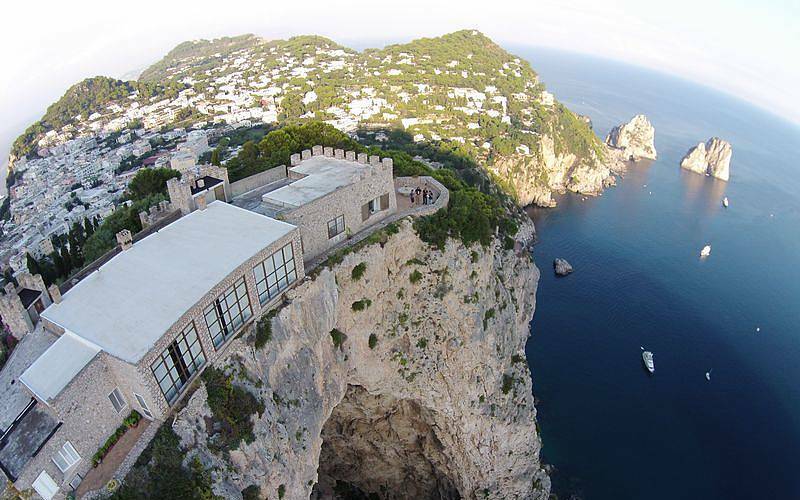 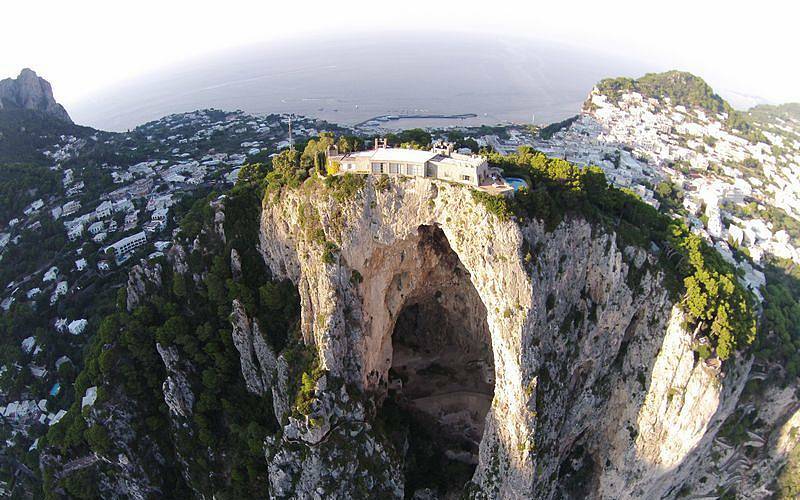 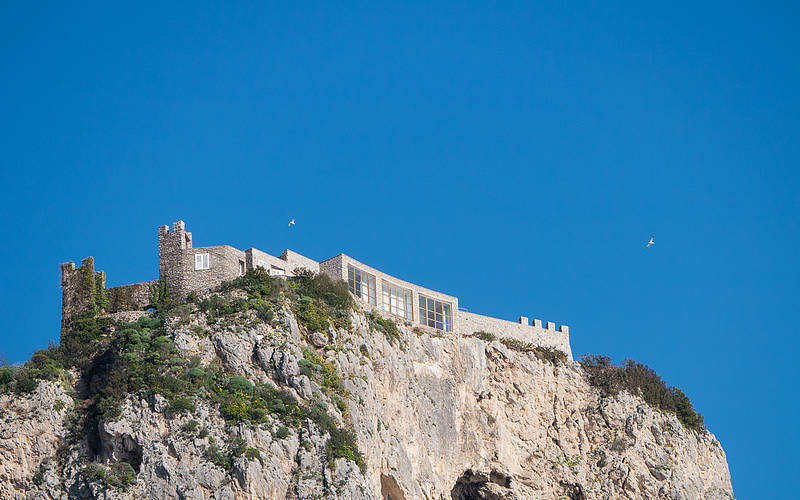 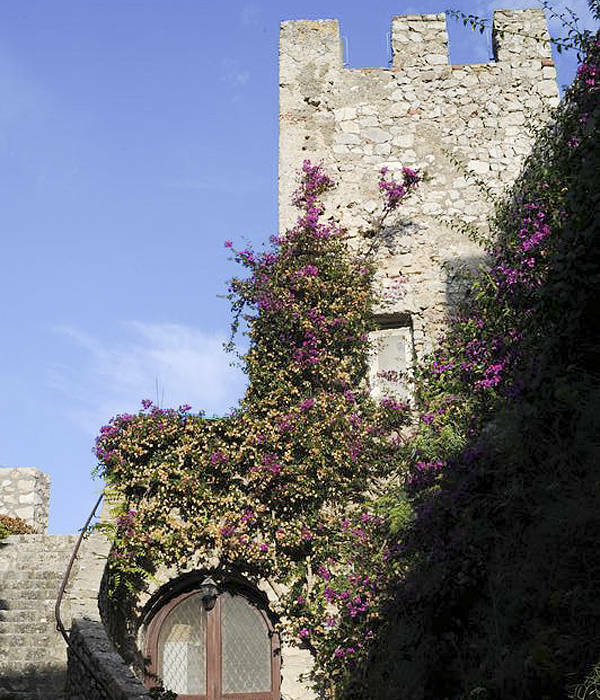 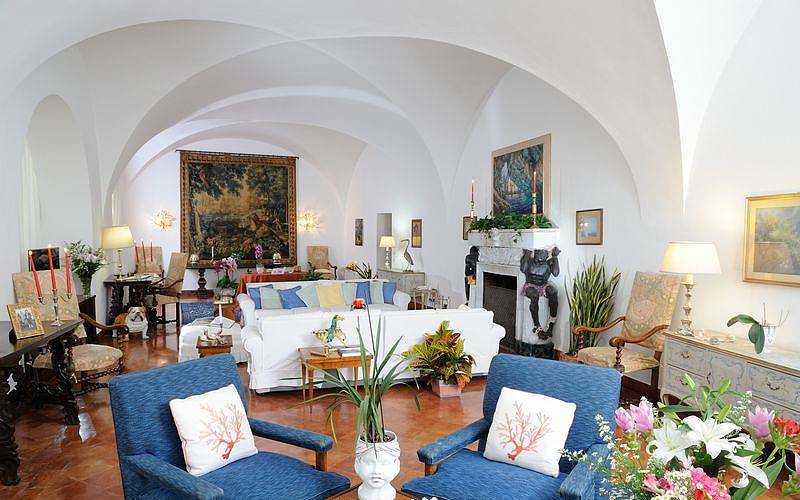 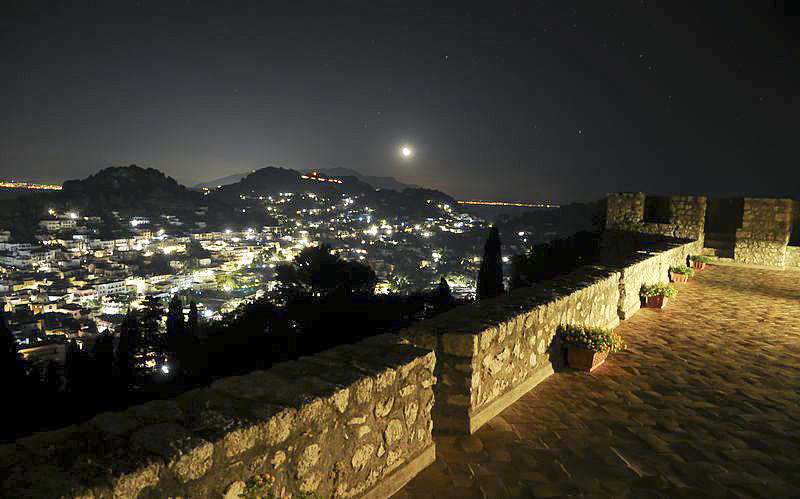 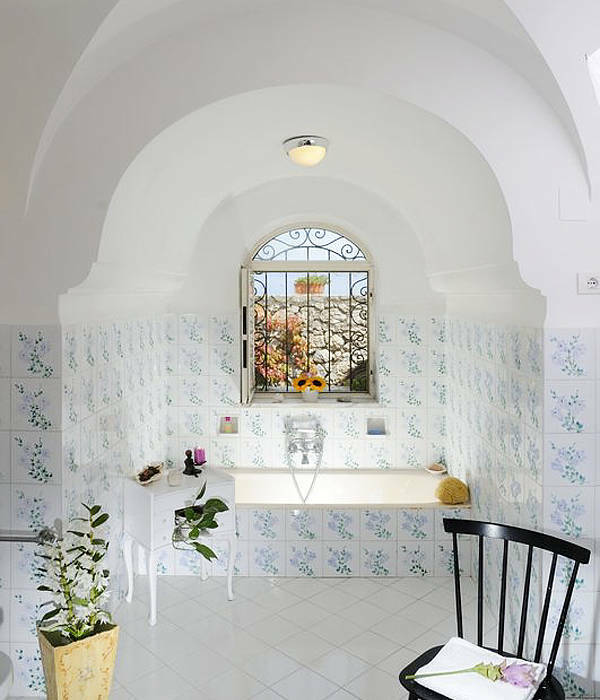 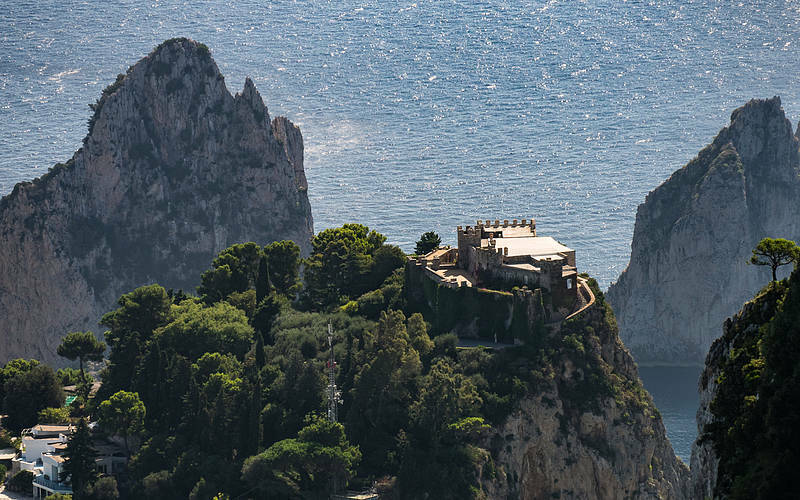 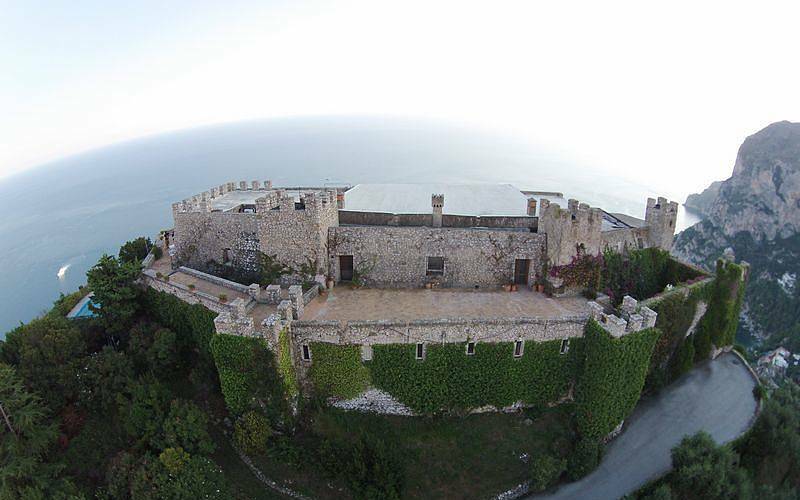 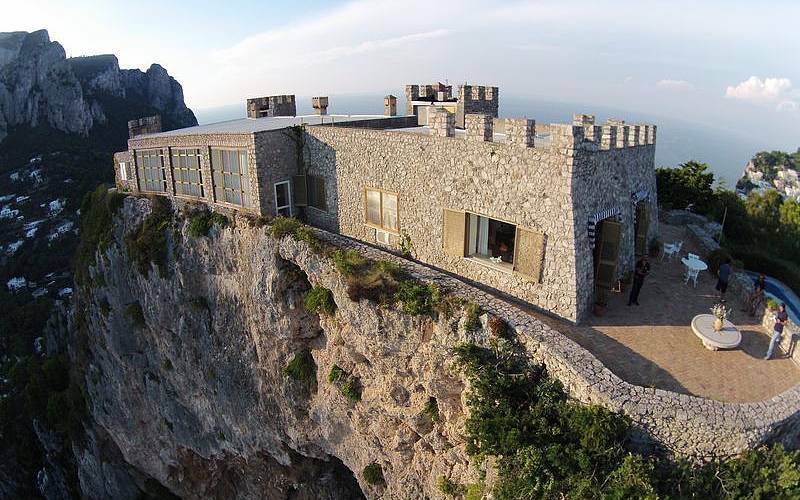 If you've always dreamed of vacationing in a castle on Capri, your dreams can now come true at Il Castiglione. 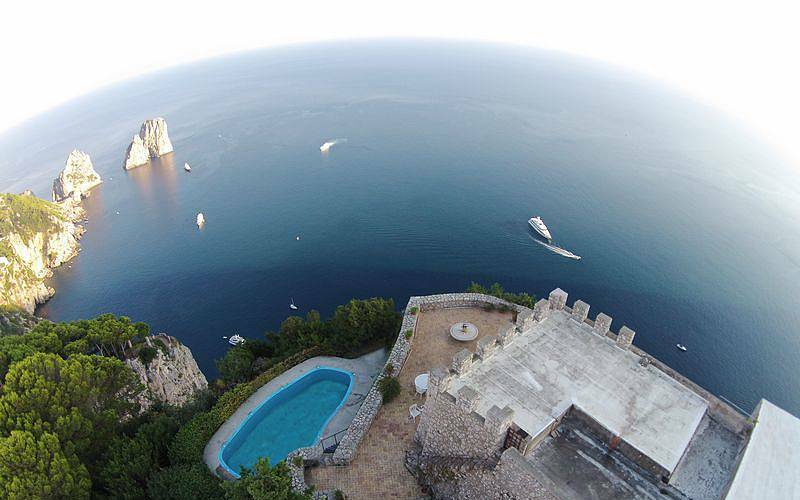 Perched on a clifftop high above the Bay of Marina Piccola, Il Castiglione is one of the most exclusive villas with a pool on Capri. 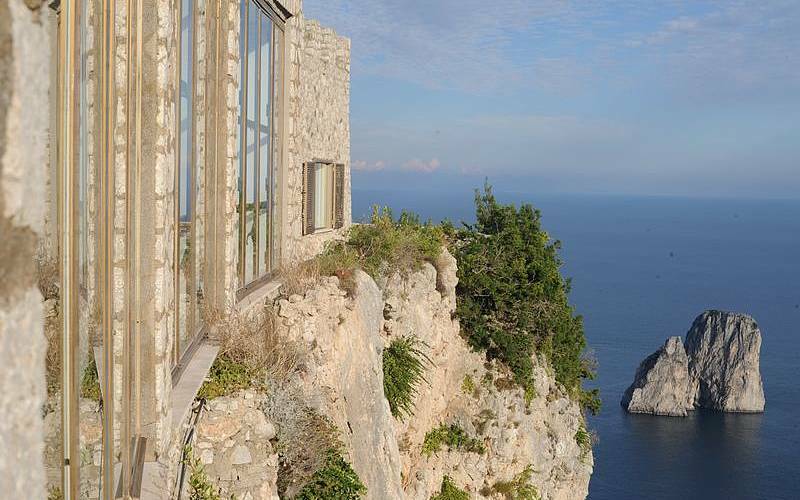 From its unique location, the villa boasts spectacular views like none others on the island. 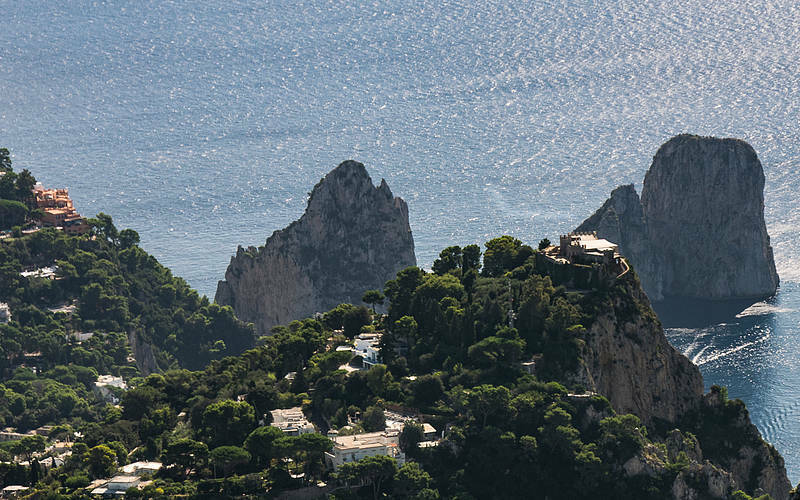 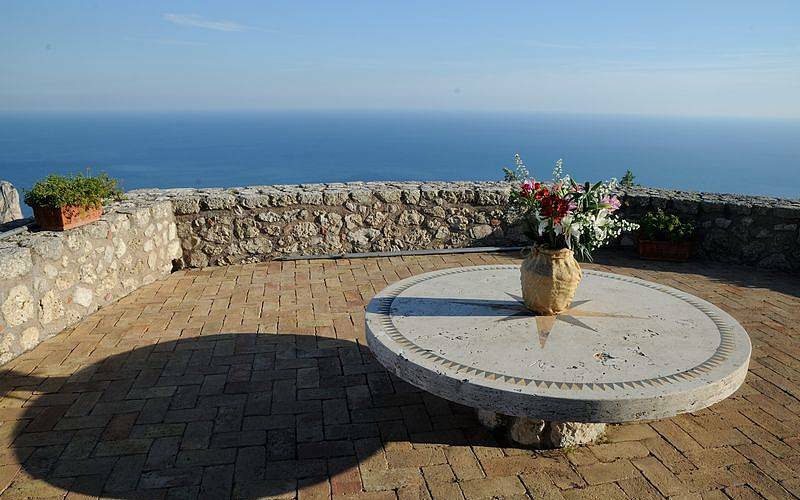 Relax on the terraces overlooking the Faraglioni, the center of Capri, and the Bay of Marina Piccola...or let your gaze wander even further to the horizon to see Marina Grande, the Sorrento Peninsula, and even the Bay of Naples. 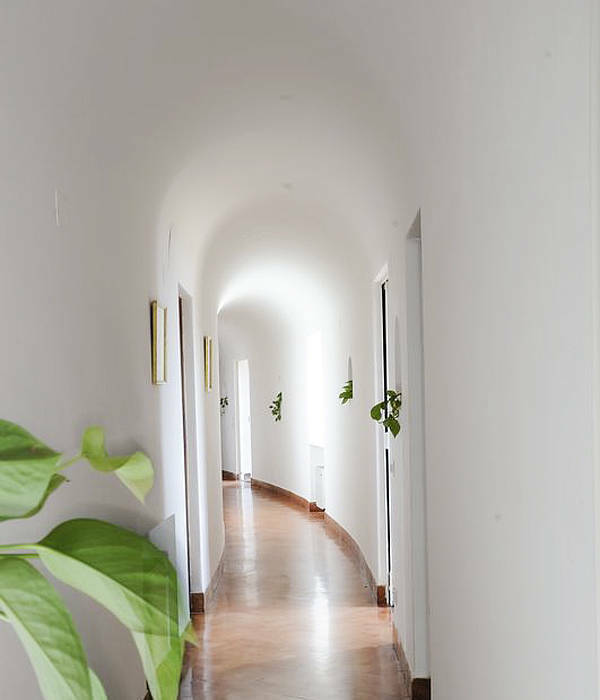 Step through the doors of Il Castiglione and be transported to a magical time and place, surrounded by the peace of the sweeping 30 square meter grounds, the stunning panoramic terraces and pool, and the elegant interiors which are both comfortable and luxurious. 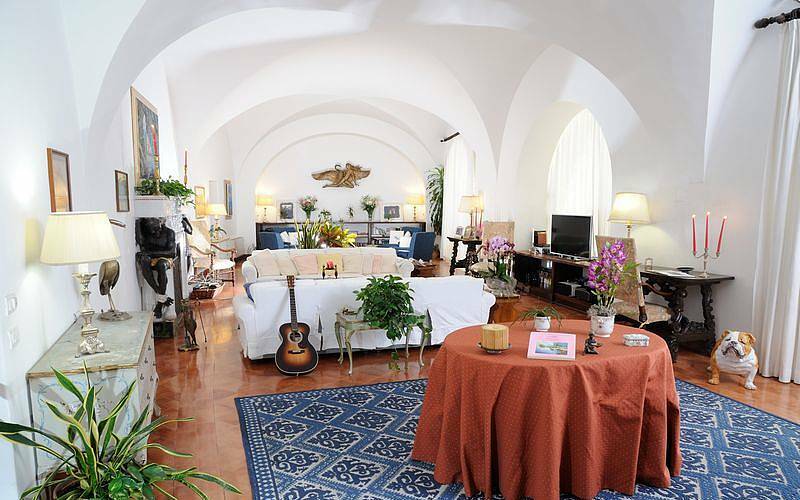 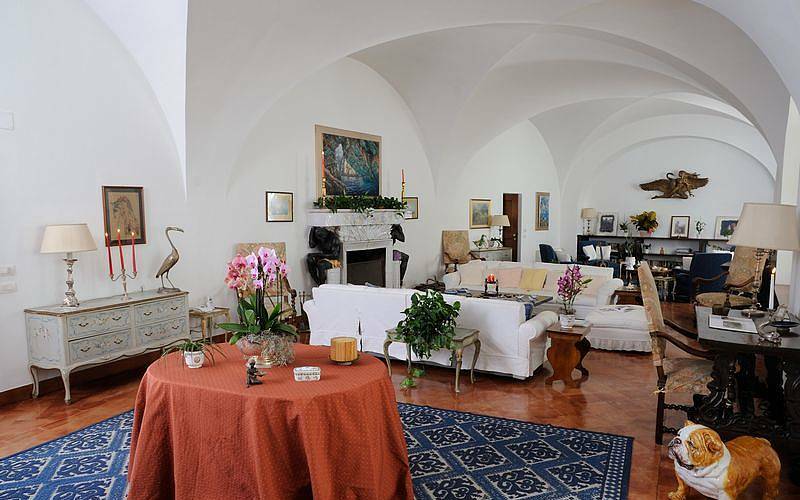 The villa centers around the spacious 300 square meter great room, furnished with comfortable couches, fine rugs, a 50" tv, and large tiled fireplace, and huge picture windows framing views of the Faraglioni and Marina Piccola. 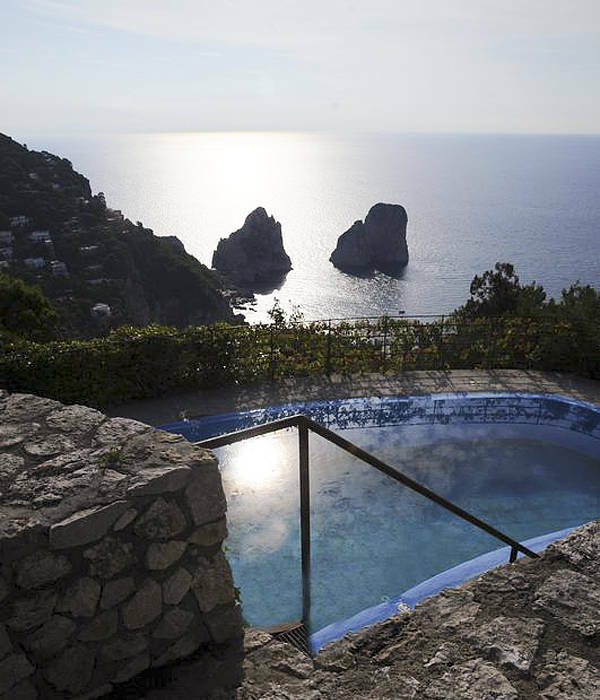 A pool overlooking the endless sea set into the cliffs directly over the waves of the Mediterranean, with views of the Faraglioni: one of the most beautiful outdoor pools in all of Capri. 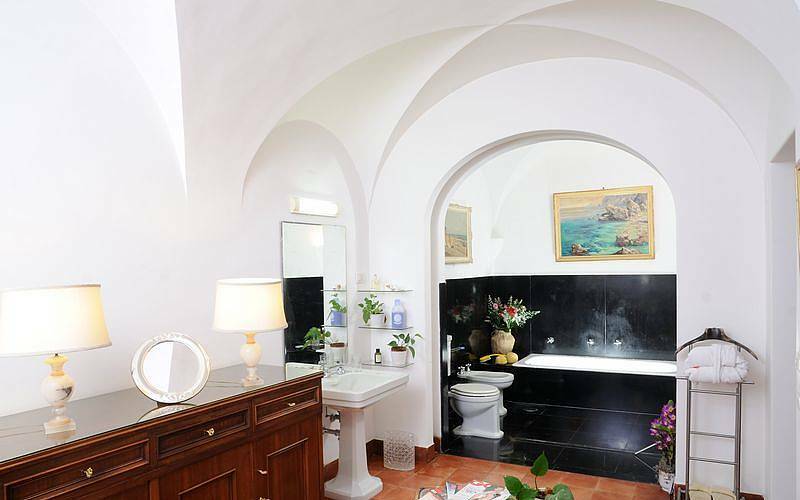 There is wifi service in the entire 1000 square meter villa at Il Castiglione, and guests can spread out among the five bedrooms: the master bedroom with ensuite bathroom with a shower and tub has a large terrace with views of Marina Piccola and the Faraglioni; the "Rosa" room has air conditioning, an ensuite bathroom with a tub, and access to the panoramic terrace; the "Vela" and "Zodiaco" rooms overlook the Bay of Marina Piccola, are air conditioned, have ensuite bathrooms, and the latter has a shower and double bed. 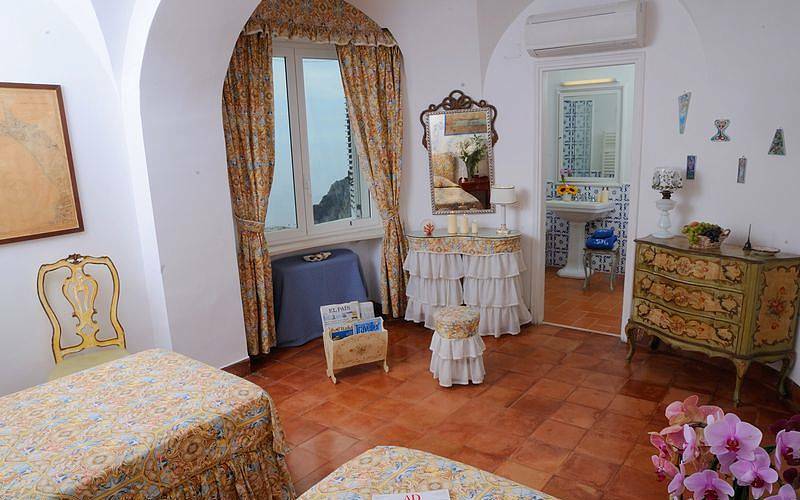 The smallest room has bunk beds, a bathroom with shower, and no air conditioning. 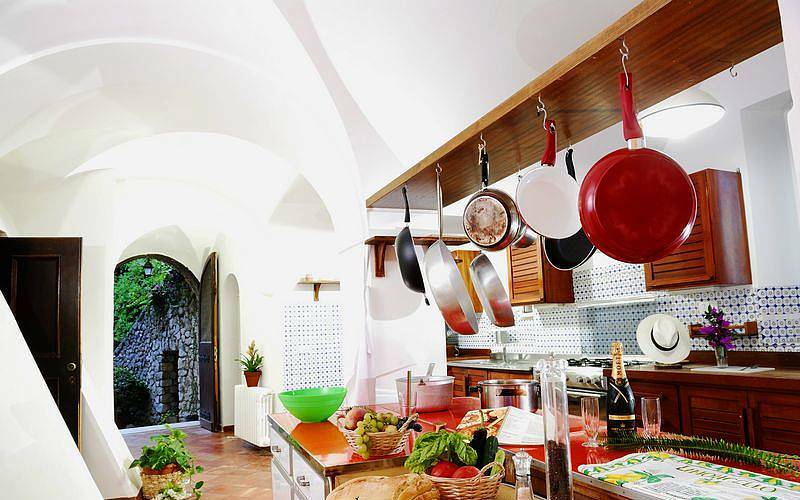 There is a pantry in the hall with a fridge, espresso machine, and dishwasher, and a small staircase leads to a service area with two independent entrances where the kitchen is located, fully-equipped with a 5-burner stove, an electric oven, a microwave, three refrigerators, a freezer, and a laundry are with washer an dryer. 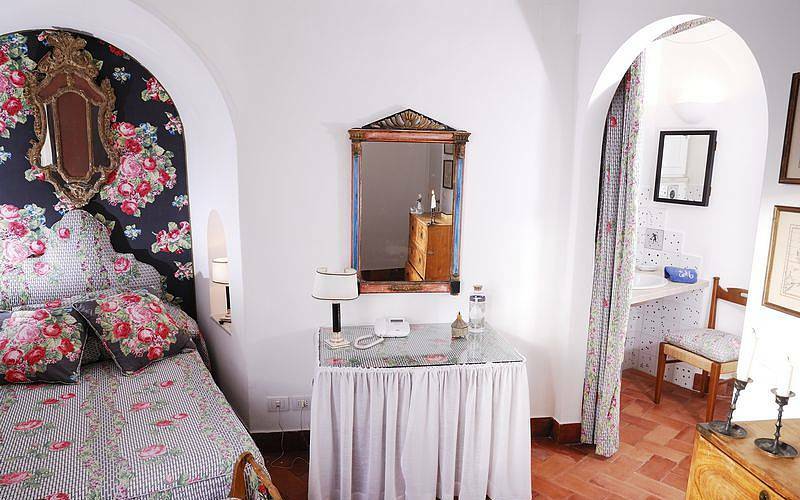 There are two staff bedrooms adjacent, one of which has a bunk bed.